Bill Cosby has been cut from a new documentary about black stuntmen, an industry he helped catalyze, and has been removed from the Black Stuntmen’s Association website. Cosby, according to Deadline, was involved with Painted Down, a film chronicling “the age-old practice of applying blackface to white stuntmen so they can double for black actors.” But now the movie’s producer is stepping away from the embattled comedian, along with everyone else, like stalwart supporter Whoopi Goldberg. 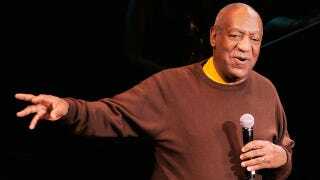 In November, Robinson confirmed that The Cosby Show front man would be involved in the film, despite accusations from numerous women that he’d drugged and sexually assaulted them in various ways. In Cosby’s Painted Down interview, he recalled realizing a white man had been hired to portray his stunts on the television show I Spy, but in black face. Cosby was so offended that he “objected” and a black stuntman was hired to portray him instead. It was the first time an actor with pull had made a fuss and was heard.